Lookonline.com/DFR Daily Fashion Report celebrates 24 years online as the first and longest running fashion site on the Internet - December 1st, 1994 - December 4th, 2018. 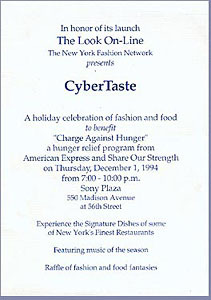 Above is a copy of the front of the invitation to the launch of the site held December 1, 1994 at Sony Plaza on Madison Avenue. Special thanks to all of our contributors including editor-in-chief Marilyn Kirschner, Rhonda Erb, Lieba Nesis, Laurel Marcus, Diane Clehane, Randy Brooke, Adrienne Weinfeld-Berg, Anna Bayle, Bernadine Morris, Grace Mirabella, Laurie Schechter. Muriel Triffaut, Ty Yorio, Eddie Mullon, and all our other current and past writers, sponsors, and friends.